Pressure Sensitive Labelers have been around for over 25 years and have evolved from simply placing a small label on flat products at slow speeds to product orientation for specific label placement at 30 per min to 600 per minute coupon labeling. Today Pressure Sensitive is considered in almost every application in pharmaceutical, cosmetic and in areas never considered previously such as ketchup and other high volume products. However, as complicated as Pressure Sensitive Labeler appear, they can be thought of in easy to digest segments. Every Pressure Sensitive Labeler can be thought of having only three basic parts. 1. 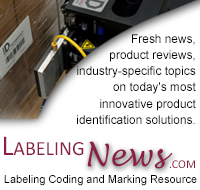 The Labeling Head: Its function is to accurately dispense a single label to the applicator at the required speed. 2. The Applicator: Its only function is to accurately place the label on the product at the required speed. 3. The Product Handling System: Its only function is to place the product consistently at the required sped in position for the applicator to do its job. These three parts are present in every Pressure Sensitive Labeling System ever manufactured. By understanding how they go together to make a system, it will enable you to be more valuable to your customers. There are other components that could be part of the Labeling System and will discuss them later in this technical not. One type bears mentioning Coders and Imprinters are used to print a batch and lot code for pharmaceutical applications or a code number for cosmetic and other applications. This coding or “Imprinting” is done before the label is dispensed. 1. The Labeling Head: As we stated its function is to accurately dispense a label from the carrier paper (web or tape) to the applicator at the required speeds. Referring to figures 1 and 2 a Labeling Head is a motor driven tape (web) transport mechanism similar to tape recorder, that can move tape (web) at speeds up to 3000 inches per minute and is able to stop within +1/64” on command. The label, which is on the tape (web), is dispensed when it reaches the Peeling bar. Now that you understand that part of the transport lets discuss other important parts of the labeler. How and what controls the starting and stopping of the labeling head is probably your next question: Well, the labeling head has a single completely solid state (Integrated circuits) Control Module. 1. By use of a light source and a phototransistor it reads the gap (matrix) between labels to tell the labeler to stop. 2. If there is a coder, the Module tells it when to operate. 3. By use of a Product Sensor it reads the presence of products to be labeled. 4. It controls the applicator. 5. It starts and stops the web drive. Read the rest of the white paper from LSI on how to understand pressure sensitive labeling equipment.